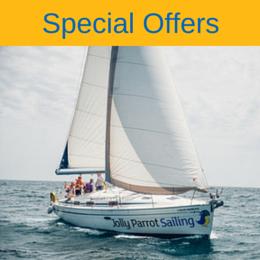 All of the Jolly Parrot Sailing yachts are British registered and VAT paid. They all conform to the MCA code of practice and are certified as a minimum to Category 2 (operational area up to 60 miles from a safe haven). Additionally, they are registered training yachts with the RYA so you can be sure that they comply to the most stringent safety codes anywhere. Over and above the inspection procedures required to conform to regulations, Jolly Parrot Sailing ensure that each yacht is lifted out of the water and thoroughly inspected at least once in any 12 month period so you can be certain that the yacht you charter is safe and seaworthy. Yacht chartering is the perfect solution for those who want to sail at their own pace. It offers a relaxing and comfortable way for you and your group to enjoy the stunning scenery and beautiful ports along the Costa Del Sol. For the more adventurous there are the Moroccan coastal harbours too. A popular option for many of our guests to charter a yacht and a Jolly Skipper to complete an RYA Sailing Course with a group of friends. This gives the ultimate flexibility and superb value for money. 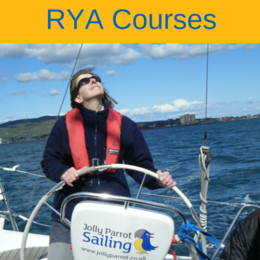 Please contact us to discuss the benefits or to arrange bespoke sailing tuition. With skippered charters it doesn't matter how much experience you have. Get involved or kick back and relax – it's your choice. When Bareboat chartering why not consider a Jolly skipper for a day or two to familiarise yourself with the yacht. Contact us for a quote. Our Bavaria 36, Jolly Parrot, is one of our primary training yachts. Her interior boasts a spacious, functional galley and large saloon that lends itself perfectly to lively entertaining or quiet relaxation. She is equipped with a chart plotter, VHF and a fully integrated class 'B' AIS transponder. She can accommodate 8 people in 3 double cabins plus 2 single, separate saloon berths. For evening entertainment Jolly is fitted with a Bluetooth stereo. Above deck, Jolly takes on a whole new personality, with easily adjustable sail controls utilising only the highest quality hardware. This generous sail plan including a laminate, slab reef mainsail, a yankee-cut jib, spinnaker, cruising chute and a full set of storm sails gets her performing up to the expectations of the most avid sailor, whether it is a light air cruise or the thrill of a total adrenaline rush when the breeze picks up. Jolly Parrot has the added bonus of having a deep lead keel which has her out-performing most other Bavaria 36 yachts and in fact, is our choice for racing in local regattas. How do I charter this yacht? To charter this yacht you must be the holder of an RYA Day Skipper qualification and accompanying ICC (International Certificate of Competence). If in doubt as to your eligibility contact us. Our Bavaria 37, Liquid Nemesis, is equipped with a generous galley, complete with a positively cavernous refrigerator and boasts a luxurious, spacious saloon area. Ideal for the taller sailor or larger bodies. She has 8 berths in 3 double cabins and 2 large separate saloon berths. She is fitted with a chart plotter, VHF radio, Navtex and fully integrated, class 'B' AIS Transponder. For evening entertainment Liquid Nemesis is fitted with a Bluetooth stereo system. Above deck the large cockpit and easily handled in-mast furling mainsail and 100% genoa coupled with the handy autohelm make longer distance, and short handed cruising, a breeze. Nemesis is fitted with a full set of storm sails and with her deep keel she is a very capable yacht. Particularly popular for family charters. Currently Liquid Nemesis is only available for Skippered charters or to those holding Commercial Yachtmaster or Yachtmaster Coastal qualifications. Silent Years is our Bavaria 46 Cruiser. She is a luxurious 10 berth, extremely spacious ocean cruiser. With her linear galley complete with two fridges and a cocktail cabinet, light wood interior and positively cavernous saloon area she is always a popular choice for larger groups. Accommodation is in 2 large rear cabins, a master suite in the bow, capable of accommodating 3 people comfortably, a bunk room for two and a single saloon berth. In fact all of the cabins are massive, so the accommodation is infinitely flexible. Silent Years boasts the usual array of navigational equipment such as Chart plotter, VHF radio, Navtex and Autohelm as well as a Bluetooth music system. Above deck, the spacious cockpit with a large cockpit table and twin helm positions, is ideal for entertaining and safe and secure for those days when the sea can be a little 'choppy'. The in-mast furling mainsail and 100% genoa make for sparkling performance both up and down wind. With her 60 Horsepower turbo-charged engine this yacht really is a mile-muncher and ideal for longer passages or for those who want to cover the ground quickly. Karelia is our 'leviathon' of the seas. With a positively enormous interior capable of sleeping 12 in 4 double cabins, each with their own heads (toilet) and a double in the saloon as well as two crew in a separate tiny cabin accessed from the deck in the forepeak. This yacht is capable of carrying 12 people indefinitely and 14 people for up to 24 hours. Karelia has a huge galley to cater for these large numbers with two fridges and a massive cooker/oven. As you can imagine with such vast accommodation, Karelia is very popular with large groups and families. As she is a slightly older yacht, she is showing some signs of wear, but represents excellent value for money and in fact, we believe she is the only charter yacht within a 40 mile radius with such vast accommodation. As expected Karelia is fitted with VHF radio, Chart plotter, Autohelm, Stereo and class 'B' AIS transponder. On deck Karelia has twin helm positions covered with a giant bimini to keep the sun off. She has a massive traditional, slab reefing main sail with 3 reefs and a 100% roller furling genoa. She also carries a cruising chute for those very light wind days. While no greyhound of the seas, Karelia is a solid dependable yacht capable of very long distances in comfort.